Could Big Batteries Be Big Business In California? Unless the erratic bursts of energy generated on a windy or sunny day can be stored and later measured out in an even way, these renewable sources of power can't be counted on to stabilize the electrical grid. Several battery-making startups hope to help — and reduce electric bills. Could Big Batteries Be Big Business In California? 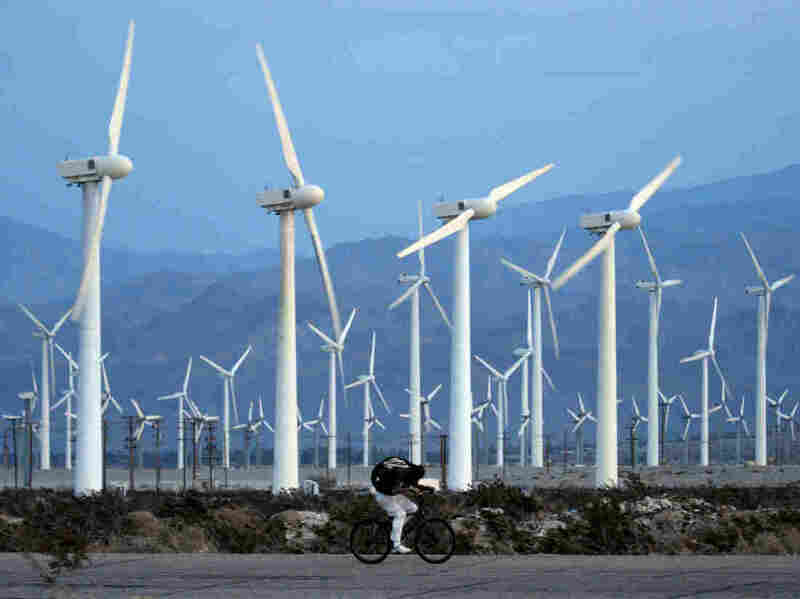 The California Public Utilities Commission has called on utilities and private companies to install about $5 billion worth of batteries and other forms of energy storage to help the state power grid cope with the erratic power supplied by wind and solar energy. The need to store energy has become urgent because the state is planning to get a third of its electricity from renewable sources by the end of the decade. And the shift in strategy could open up some big opportunities for small startups, including one called Stem. 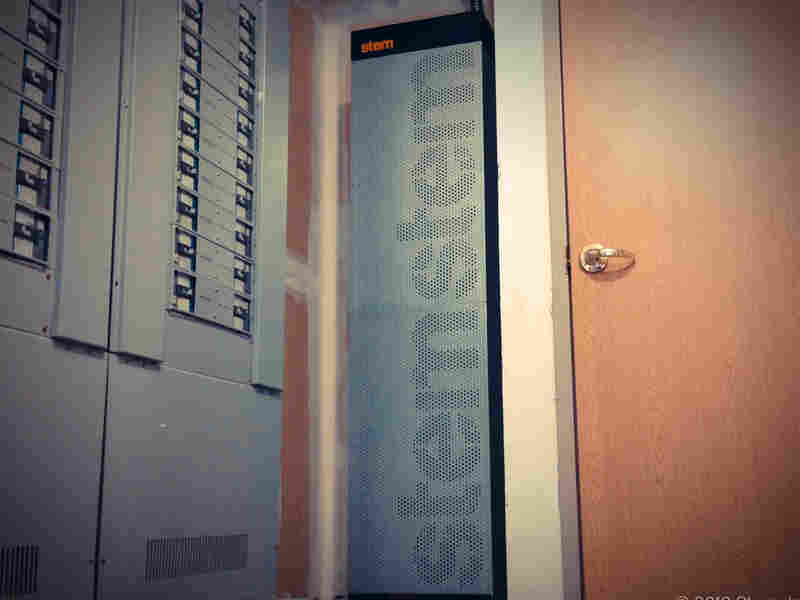 Stem is housed in an abandoned showroom in Millbrae, Calif., just across the highway from San Francisco International Airport. And the company is not just aiming to help the state's power grid. "We make a product that reduces electricity bills for businesses," says Tad Glauthier, Stem's vice president for customer development. In fact, Stem's first priority is to focus on individual businesses. To explain how this works, Glauthier walks over to a couple of large computer monitors hanging on the wall. "The monitor on the right is showing the electric load from the carwash across the street," he says. The graph is all over the place. There are lulls when the carwash is waiting for business — punctuated with big spikes when blowers, vacuums and other large pieces of equipment switch on. "If you look at just the range within the last 15 minutes, that's an incredible amount of volatility," Glauthier says. "The utility has to serve them that electricity." It turns out that the carwash has to pay extra on its electric bill for those periods of high demand. All companies in California get billed for their peak use, as well as their total electricity consumption. So if the carwash can shave off those power peaks, they can also shave this extra charge from their electric bill. Here's how Stem does it: When demand spikes, batteries kick in so the company doesn't have to draw so much from the grid. The battery packs it installs in businesses look like glitzy gym lockers, and are controlled by a small computer connected to the Internet. The computer's job is to decide when a company should be pulling energy from its batteries, rather than from the grid. When the company's energy demand is low, it can recharge the battery. "With the Stem system, they're not using less power," Glauthier explains. "They're just using power in a more level way." And by doing that, the company is reducing the part of its bill that's based on peak power usage. So is Stem simply building a system that allows companies to "game" their electric bills? Glauthier says no. "You absolutely help the [power grid] system," he says. But Glauthier may be getting a little ahead of himself here. "Right now, it does only help the customer," says Haresh Kamath, a battery expert at the Electric Power Research Institute in nearby Palo Alto. Kamath says batteries will eventually help the state power grid deal with the ups and downs of electricity supplies from wind and solar. But it will take a lot of battery power to make a difference. That's exactly why the California Public Utilities Commission has called for billions of dollars of energy storage to be installed between now and 2020. "If you get a small energy storage system in everybody's home, or every business, that could have a substantial impact on the grid as a whole," Kamath says. "Of course right now it's difficult to do that because it's a relatively expensive product." Everybody is hoping that creating this huge demand for batteries will also help drive down the cost. Batteries can help with short-term power fluctuations — like those created when a cloud passes over a bank of solar panels, for example, or when the air goes still at a particular wind farm. And they can help keep the power grid stable, as operators work to match supply and demand second by second. Stem plans to scale up its operations so it can play a role in stabilizing the grid. The grid operator actually pays for that service, so it could be another revenue stream for Stem. Glauthier says the company has installed just 10 systems so far, but it has 150 more orders in the works. And once they reach a critical mass, the company will be able to control all of the batteries it installs from one central location. "It's taken us 4 1/2 years to get here, and I think there's another three to four years to go before we're really blowing the doors off," Glauthier says. And they do have competition, including Tesla Motors, which has teamed up with a solar energy company to get into this business as well. The race is not simply to refine battery technology, but to invent business models that will make energy storage practical.